A new bus only roadway on the edge of Great Shelford and Stapleford could be built as part of the City Deal proposals for Cambridge. 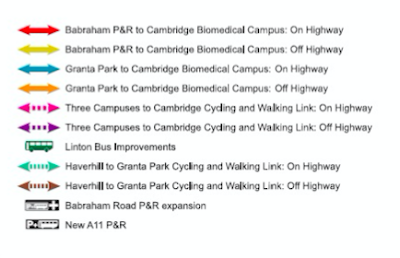 The plans include a segregated bus-only road linking Granta Park, Babraham Research Campus and Cambridge Biomedical Campus. The route of the proposed new road skirting the edge of the village can be seen on orange on the illustration below. This bus link could join up with the Guided Busway at Addenbrooke’s.The indicative cost would be £98m.